Aji Abiedu is a civil litigation attorney representing clients in a variety of litigation matters. Her practice is divided between professional liability defense, with particular emphasis in defending lawyers and law firms against claims of professional negligence, labor and employment, products liability, consumer litigation and healthcare defense. 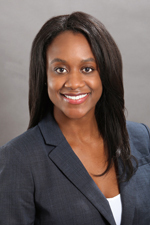 Aji joined Hinshaw & Culbertson LLP in June 2012. Previously, she was a law clerk with the firm. During law school, Aji studied International Law at University College London, where she received the International Information Technology Law CALI Award. She was also a member of the Black Law Students Association. Prior to her legal career, Aji worked as an assistant to Dr. Linda A. Smith, organizer of the Children's Defense Fund (CDF) Freedom Schools Program for the Los Angeles County Second District. She assisted Dr. Smith in opening five CDF Freedom Schools, focused on improving literacy. In addition, Aji also received training in pharmacy services from SA-VON Pharmacy and CVS Pharmacy. In her free time, Aji enjoys traveling, running, and horseback riding.